Guillamón, Agustín. 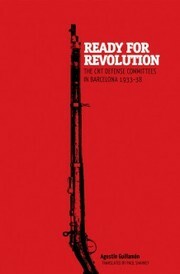 Ready for Revolution : The CNT Defense Committees in Barcelona, 1933-1938 . AK Press and Kate Sharpley Library: 2014. 261 pages. Translated by Paul Sharkey. A chronicle of the armed wing of the anarcho-syndicalist union that evolved from workers' defense to organizers of armed resistance to the Fascist coup, to militia administrators, and finally to coordinator of industrial self-management and food distribution during the Spanish revolution. A fascinating new history wrapped in a lively narrative making the reader an eyewitness to history as it unfolds. 9781849351423 Not currently available. Find at a local library.